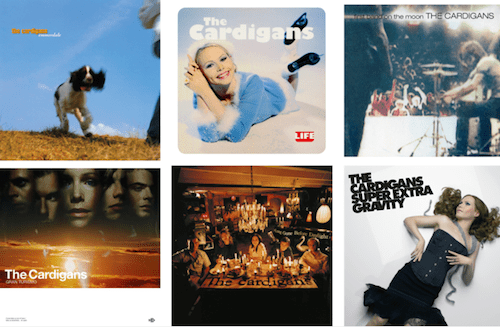 01 February 2019 (Toronto, ON) - Today, the celebrated Swedish quintet, The Cardigans, will have released remastered vinyl re-issues of their entire studio album repertoire including First Band On The Moon, which features the international hit single, “Lovefool”. The album was a major breakthrough for the band, both in their native Sweden and internationally as it was their best-selling album in the United States. Order the vinyl HERE. Available on wax for the first time today is the band's head-turning debut Emmerdale; plus, the last album of their spellbinding 1991-2005 creative output, Super Extra Gravity. Also out today on vinyl: Life (1995), Gran Turismo (1998), and Long Gone Before Daylight (2003). All albums have been remastered at Sterling Sound studios in New York and will be pressed on gatefold 180g gram vinyl. Formed in the small village of Jönköping, Sweden, in 1992, The Cardigans are a Swedish pop rock band who met as teenagers and would go on to find world-wide success. With six critically acclaimed studio albums to their name, the band have sold over 15 million albums worldwide to date and have scored multiple hit singles and award nominations in the process. The band’s music has been prominently featured on a number of film soundtracks including A Life Less Ordinary, The X Files and perhaps most prominently on Romeo + Juliet which featured the international hit "Love Fool". Taking a hiatus after their 2006 tour, the band reunited in 2012 to play several concerts and continue to perform to dedicated audiences across the globe.